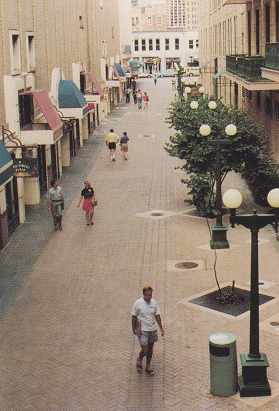 In 1990, the largest installation of concrete pavers in the U.S. totaling more than 1.1 million square feet gave a fresh new look to downtown San Antonio. Requiring more than 4.5 million units, the project (a winner in the 1991 North American Concrete Paving Awards Program) involved repaving 10 miles of sidewalks and 5 miles of streets in a 70 block area of the city's central business district. Alamo Concrete Pavers supplied the units. All are rectangular (4 in. x 8 in.) Holland pavers are made of 8000psi concrete three thickness and nine colors. Three separate teams of architects worked on the revitalization plan, each responsible for a different part of the downtown area. 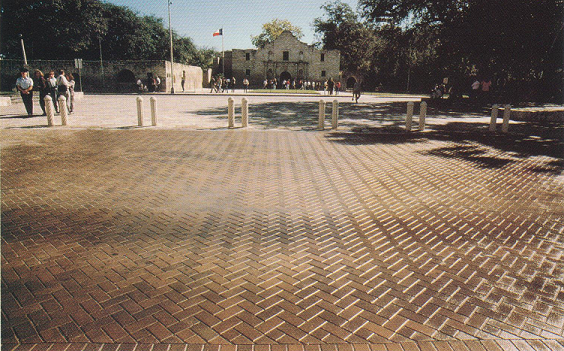 The unifying factor is all three designs was the use of pavers to help recapture San Antonio's historic past when its streets and sidewalks were surfaced with clay brick. On sidewalks, plazas and other pedestrian walkways, the pavers are 2 3/8 in. and 3 18 in. thick. On streets, the pavers are 4 in. While all 70 blocks of the rectangular pavers are laid in a herringbone pattern, those installed on sidewalks are placed parallel and perpendicular to the flow of pedestrian traffic. Our 40,000 sidewalk pavers are engraved to honor people for their accomplishments and support. On streets, the herringbone pattern is at a 45-deg. angle to the flow of traffic, to providing a strong interlock between pavers. Over the last 20 plus years, these pavers have with-stood heavy traffic loads, permitted numerous repairs to various underground services while requiring very little maintenance.